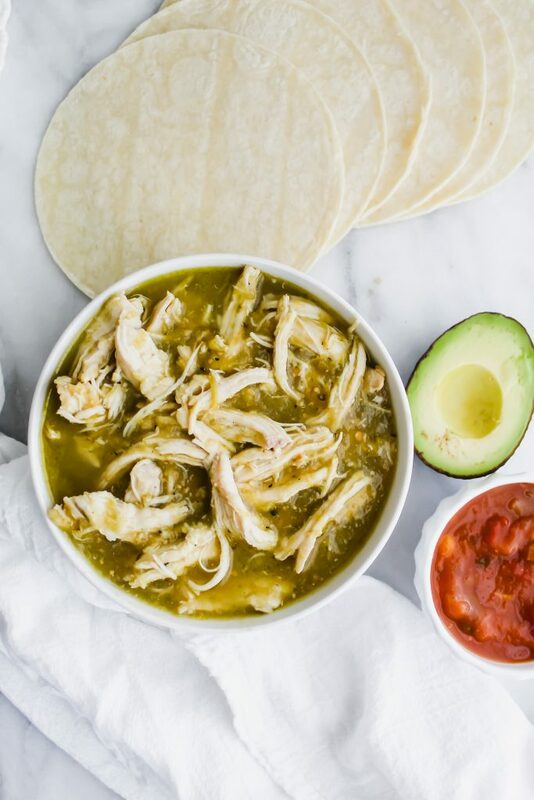 This 2 Ingredient Salsa Verde Chicken is mouthwatering! It’s extra tender, juicy and full of flavorful spices. It’s the perfect add to tacos, burrito bowls, salads or eaten by itself! You guys. I have a confession to make. I have an obsession with salsa. It’s bad. Like, if I don’t have fresh salsa on hand – I may go mad. My all time favorite red salsa recipe is of course, my Easy Homemade Salsa recipe. This was, in fact, the recipe that turned me on to actually liking to fresh tomatoes. For years, I turned my nose up at them. They were too juicy and watery and just blegh. But then I made this fresh homemade salsa, my world forever changed. The tomatoes were full of flavor, juicy, and were the perfect combination for the spicy flavors in the salsa. I could rant forever about how much I love that salsa. However, I still haven’t ventured on making a homemade Salsa Verde. Why, you ask? Because I already have found a brand that checks off everything on my list! 1) It’s cheap! 2) It’s made with minimal ingredients and no added sugar! 3) It’s the perfect combination of a little spicy, a lot juicy, and the most flavorful. 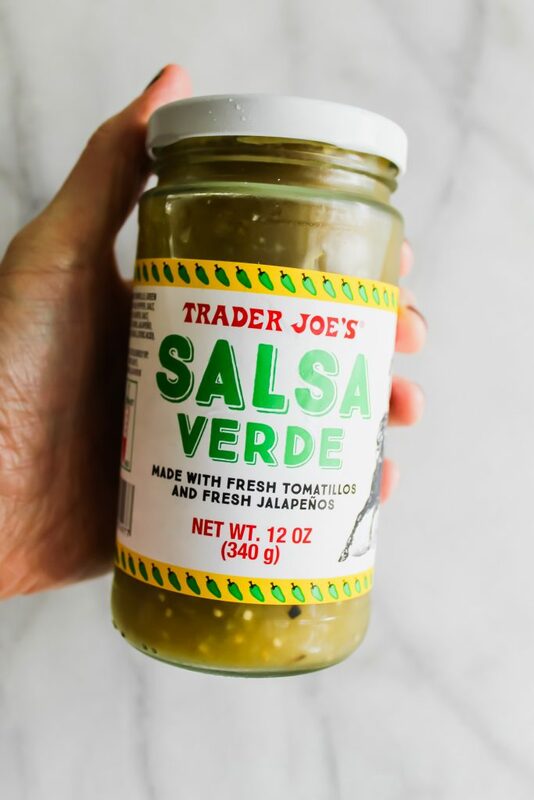 Yup, It’s Trader Joe’s brand Salsa Verde. It’s the bomb. You can find out about it more on my 18 Favorite Trader Joe’s Items post I did a few months back! What’s the difference between red salsa and salsa verde? Red salsa is usually made with roma tomatoes and is obviously – red. Many people vary in how they make their own – but there are usually roma tomatoes, garlic, jalapenos, lime, cilantro and salt. Salsa verde is similar except they use tomatillos instead of roma tomatoes. Wow. Bet you didn’t see that coming! Okay, and to be honest, you will need just a few spices. But, I feel like spices don’t really count as ingredients because you most likely have these already in your cabinet. But, the good news is if you don’t happen to have the spices, the salsa verde has enough flavor to carry the chicken through! But, of course – some garlic powder, onion powder, salt, pepper and cumin wouldn’t hurt if you happen to have it on hand. 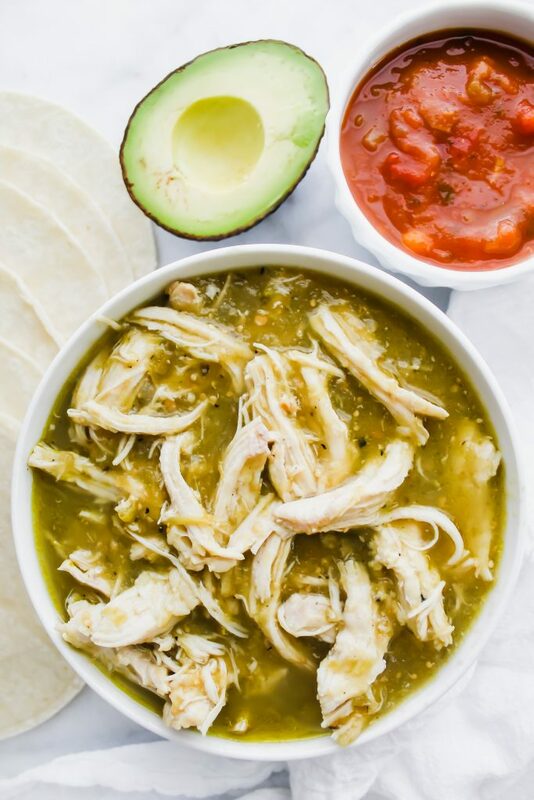 Okay, so, my preferred way to make this Salsa Verde Chicken is in the Instant Pot. It’s super duper fast and retains the moisture of the chicken inside of the pressure cooker. Although, I must say, my Instant Pot seriously freaks me out. Like, I’m always afraid it’s going to explode on me. 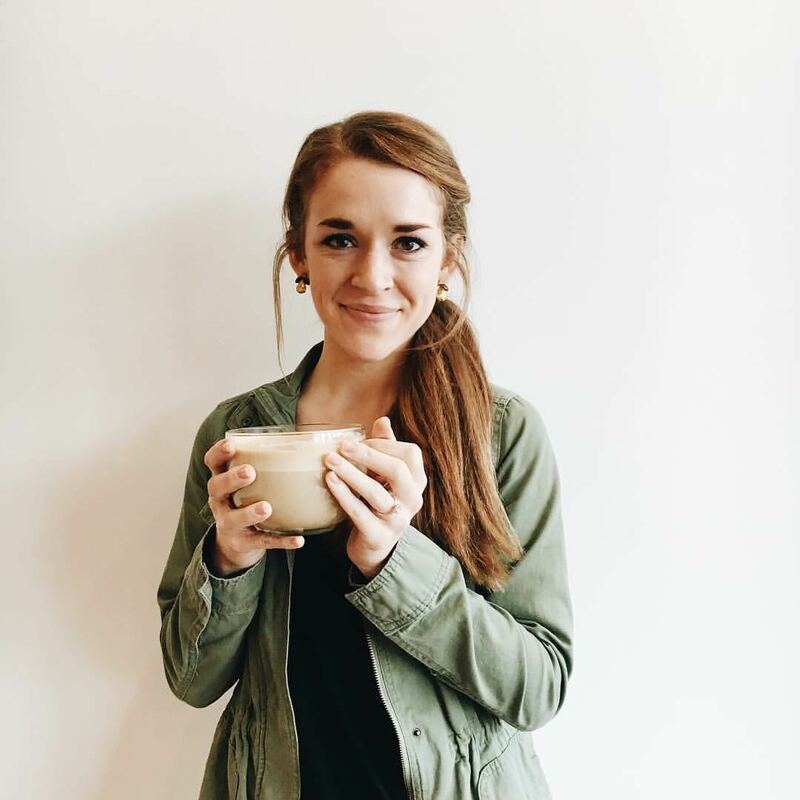 Is anyone else scared of their Instant Pot? Let me know in the comments. So: Instant Pot. 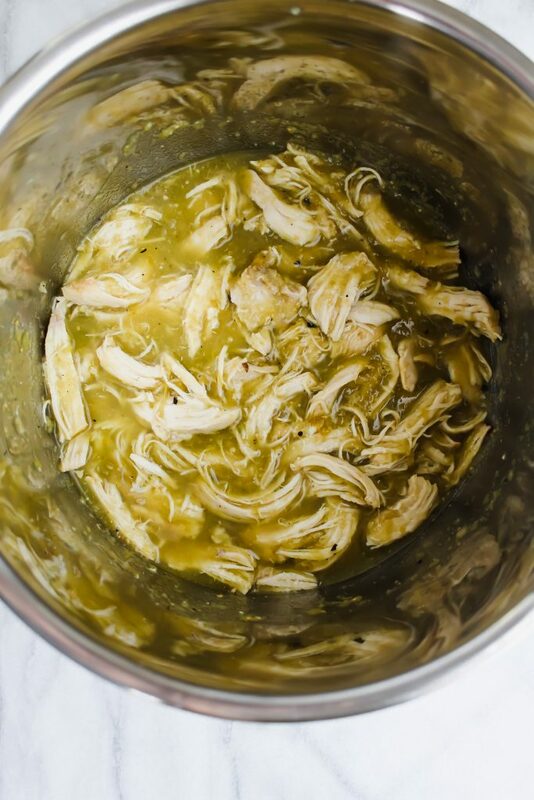 Place the raw chicken breast in it and cover it with the spices and the entire can of salsa verde. Pressure cook it on high for 20-ish minutes. Let the steam release. Shred it. You’re done-zo. 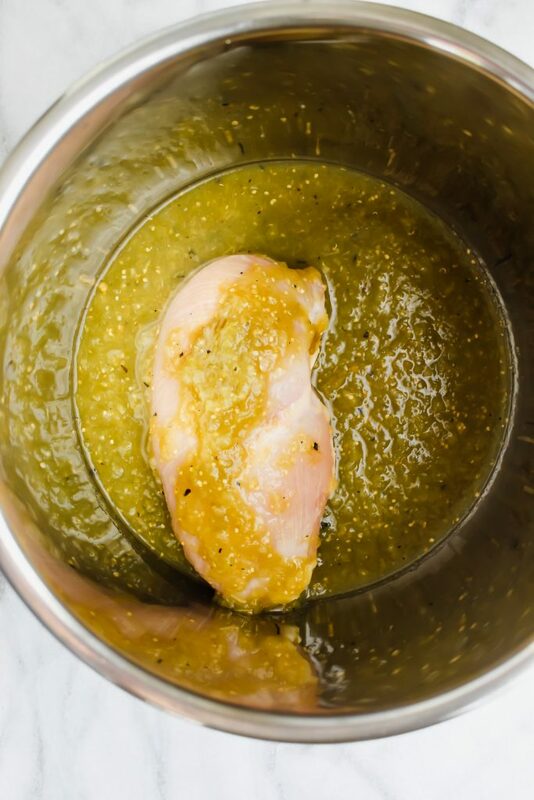 So, combine the amazing Salsa Verde with a big ol juicy chicken breast and what do you get? The most amazing, flavorful, TENDER chicken you have ever eaten. The chicken just gets fully immersed in the entire jar of salsa verde. It soaks into it and I swear, I’ve never shredded chicken easier in my life. Feel free to remove some of the liquid of the salsa verde if you don’t want it as liquid-y. However, I think the salsa verde liquid has the MOST flavor. If anything, put it on rice! Or eat it by the spoonful. You can cook it in your crockpot or slow cooker as well! Do the same thing – cover the chicken breast with spices, salsa verde and cover with lid. Cook on low for 4 hours or high for 2 hours. Shred and you’re done! Lastly, if you want to bake it, you can do that as well! 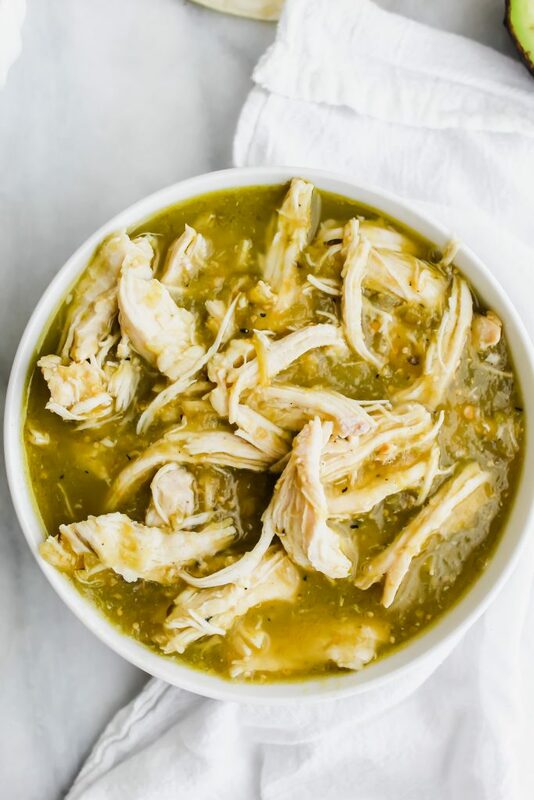 Place in an oven at 350 with the chicken and salsa verde in a baking dish. Bake for about 30 minutes. Shred. You’re done! It’s literally that easy. And the result is the most delectable, moist chicken you’ll ever have! Yes, it’s extremely versatile and amazing. Perfect on anything. Especially tacos. Hope you guys enjoy this 2 Ingredient Salsa Verde Chicken! It’s a perfect Fall recipe – especially since you can let it cook while you go cozy up with a new book! Enjoy! 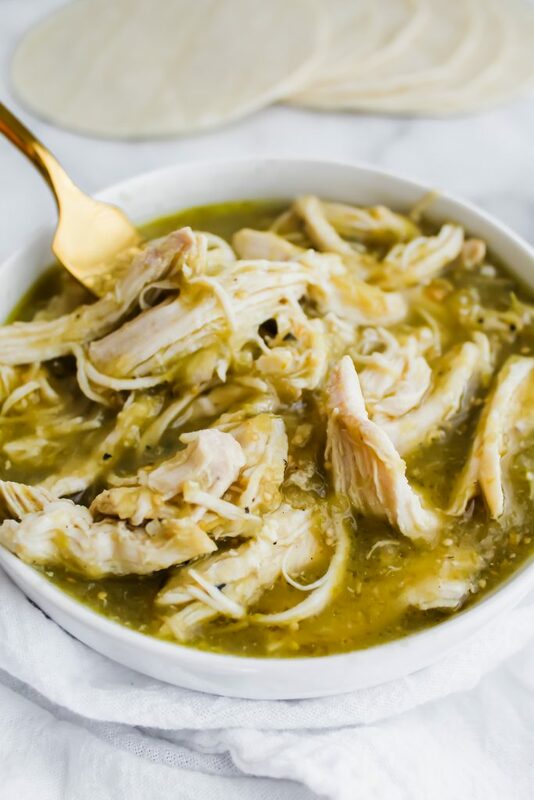 Place raw chicken breast, spices and jar of salsa verde into the Instant Pot. Cook on high pressure for 20 minutes. Release steam valve. Shred. Adjust seasoning if needed. Enjoy! 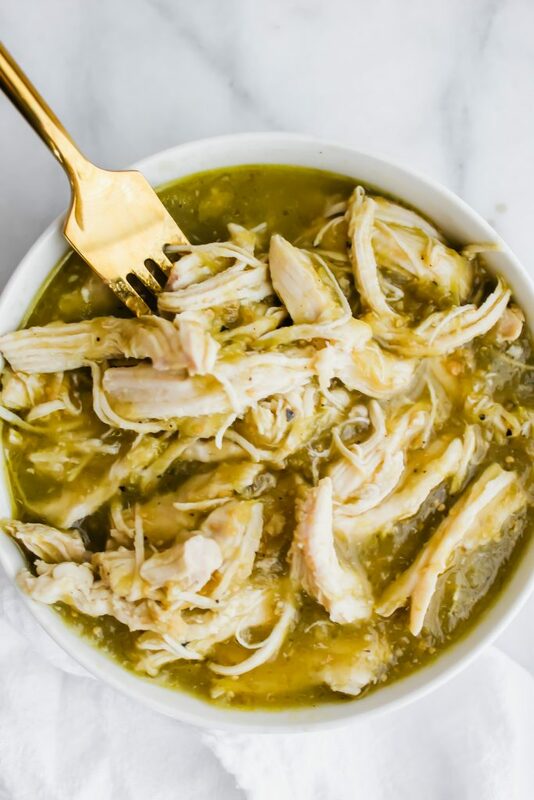 Place raw chicken breast, spices and jar of salsa verde into the crockpot/slow cooker: Cook on high for 2 hours or low for 4 hours. Shred. Adjust seasoning if needed. Enjoy! Preheat oven to 350. Place chicken breast, spices and jar of salsa verde into a baking dish. Bake for 30 minutes or until done. Shred. Adjust seasoning if needed. Enjoy! 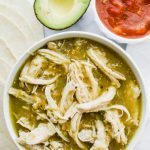 Enjoy this 2 Ingredient Salsa Verde Chicken on salads, tacos, burrito bowls, over rice or just by itself! Thanks for the comment, Sarah! This is one of my favorite chicken recipes!